ELKHART LAKE, Wis., May 17, 2016 – Anyone in the Chicago area who is interested in attending this year’s Verizon IndyCar race at Road America, but not interested in dealing with the traffic, this is the perfect solution. For the first time, Road America will do all the driving by operating an IndyCar Express tour bus provided on Sunday, June 26, offering VIP service from the Chicago area to Road America, and returning after the race. 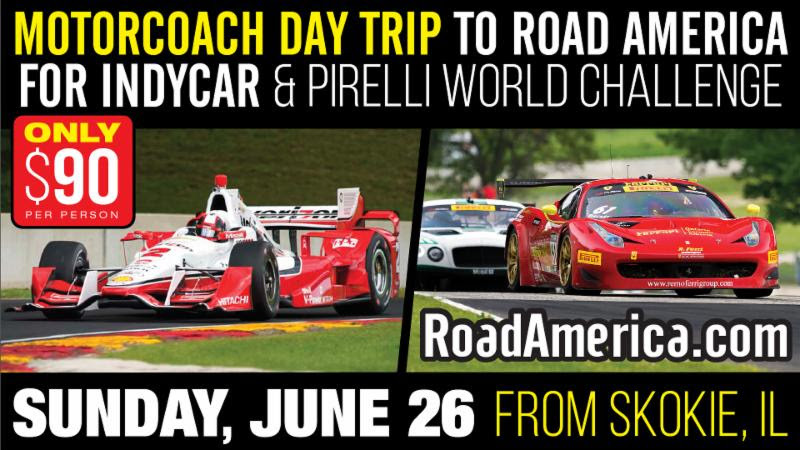 This is a great opportunity to see four races in one day at the world’s fastest road course. For just $90 each, riders get admission and convenient round-trip service from Skokie, Ill., to Road America. Express bus service will depart from Niles North High School located at 7700 Gross Point Rd, Skokie, IL 60077 at 7 a.m., and return trips will depart from Road America at 4:30 p.m. sharp. So this year, spend less time sitting in traffic, and more time enjoying the Verizon IndyCar race and Pirelli World Challenge races throughout the day on behalf of your friends at Road America. For more information on the Road America IndyCar and Pirelli World Challenge Express, and to reserve your spot, visit www.roadamerica.com or call 800/365-7223. Small collapsible coolers are allowed on board. No carry-ins allowed and all bags are subject to search. Visa, MasterCard, Discover and American Express accepted.